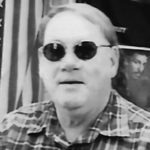 EAST BROOKLYN – John Scott Kline (“The Colonel,” “John Boy”), 59, of East Brooklyn passed away unexpectedly Friday, February 8, 2019 in Romeoville. Memorial visitation will be at the RW Patterson Funeral Home today, Wednesday, February 13, from 5 until 7 p.m.
Cremation rites were accorded and his ashes will be spread at sea. He was born May 17, 1959 in Joliet, son of Dorothy Lee Ballun Neitzer and Charles Kline. He graduated from Gardner South Wilmington High School in 1977 and soon after began his career with the Seafarers Union as a deckhand with material service in Romeoville. He was a member for 39 years. He was a fan of NASCAR racing, Harley Davidson motorcycles, and ships; enjoyed traveling to Florida; and hunting prairie dogs with friends in South Dakota. He also enjoyed camping, four-wheeling and building model cranes, and farming. He thoroughly enjoyed drinking Busch Light with dear friends at Reco’s, and would help anyone with anything anytime. He will be missed by all who knew and loved him. Surviving are brothers: Brian “Burt” (Angi) Neitzer of Gardner and Ronald T. “Tom” (Lorraine) Neitzer of Apache Junction, AZ; niece, Jacque (Dave) Nilsen, and great-nephews, Brody and Mason Nilsen of Mesa, AZ; and goddaughter, Maranda Residori of South Wilmington. Preceding him in death were his parents; and nephew, Andy Neitzer. In lieu of flowers, memorial donations in his name may be directed to your favorite charity.